“Horrors of Malformed Men” (1969, Arrow Video) Amnesiac medical student Teruo Yoshida flees the asylum in which he finds himself imprisoned and immediately finds himself accused of murdering a circus performer. By chance, he discovers that a man to whom he bears a strong resemblance has died, and through means better seen than understood, adopts his identity. The upside to the masquerade is his indulgence in the dead man’s life, from his wealth to his wife and mistress. 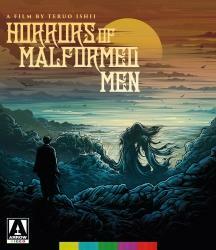 The downside comes, as much of prolific cult director Teruo Ishii’s film does, seemingly from nowhere, as Yoshida and others travel to a remote island, where the dead man’s father, (butoh dancer Tatsumi Hijikata), a web-fingered mystic, is intent on creating monsters from unwilling subjects. Long unavailable to Western audiences, and for a time, banned in its native Japan, “Horrors” – adapted from a story by Japanese author Edogawa Rampo – is utterly bizarre, to say the least, slipping from experimental film to exploitation and surreal comedy without regard for cohesiveness or comprehension; for those who enjoy having their third eye scrubbed clean by their entertainment, Ishii’s film will rest comfortably in their collection somewhere between Alejandro Jodorowsky, Jess Franco and “Who’s Crazy?” Arrow’s Blu-ray includes commentary tracks by Mark Schilling (comprehensive, and culled from the previous Synapse DVD) and Tom Mes (doing his best to make sense of things), as well as appreciations from directors Minoru Kawasaki and Shinya Tsukamoto, and interviews with Ishii and screenwriter Masahiro Kakefuda. “The Swarm” (1978, Warner Archives Collection) Scientists and the military work overtime to stop a colossal squadron of killer bees from decimating the Southwestern United States. Ludicrous mix of ecological horror and disaster epic from “Towering Inferno” producer Irwin Allen, who also directs; his primary focus appears to be conceiving ways to kill off his cast, which here includes Michael Caine, Katharine Ross, Henry Fonda and a love triangle involving Olivia de Havillland, Fred MacMurray and Ben Johnson, all doing Herculean work to keep a straight face. Only a fraction of them reaches the end of the picture, which for Warner’s Blu-ray, runs 156 minutes with the addition of 40 minutes of scenes not included in the theatrical release; for camp/badfilm fans, the expanded running time for this already delirious and overlong thriller may require multiple pinches to dispel disbelief. A promotional featurette and the original trailer round out the disc. “Strait-Jacket/Berserk!” (1964/1967, Mill Creek Entertainment) You may recall the episode of “Feud: Bette and Joan” in which Jessica Lange’s Joan Crawford is overwhelmed by a raucous audience at a film screening; the picture in question is William Castle‘s “Strait-Jacket,” which is packaged in Mill Creek’s unfortunately titled “Psycho Biddy” double bill with the 1967 Crawford chiller “Berserk!” Both are overripe potboilers that hinge largely on Crawford’s second-inning career as a horror icon, and she doesn’t disappoint in either case. “Strait-Jacket” is the more enjoyable of the two, with a script by Robert Bloch that pilfers gleefully from his own creation, “Psycho,” right down to the switcheroo ending, and a bombastic Crawford performance that seems to touch on all of her screen personas (’20s Vixen, ’40s Woman of Character, ’60s Matron in Hysterics). Diane Baker, George Kennedy and an uncredited Lee Majors all run afoul of Joan’s axe (but is it hers?) at some point, and director/producer Castle keeps the pace brisk and the blood flowing. “Berserk!” from producer Herman Cohen (“I Was a Teenage Werewolf”) is essentially a catalog of grisly murders at a circus run by Crawford’s domineering ringmaster. The killings are unpleasant to consider (woman sawed in half, spike through the head) but executed in largely bloodless form, and the behind-the-scenes drama is unremarkable (some illicit affairs and Judy Geeson as Crawford’s wayward daughter), leaving Crawford to hold interest by alternately snarling at business partner Michael Gough or slithering over new tightrope act Ty Hardin. Cult/camp aficionados will undoubtedly agree that Miss Crawford succeeds in that regard. Both titles on Mill Creek’s Blu-ray are widescreen. 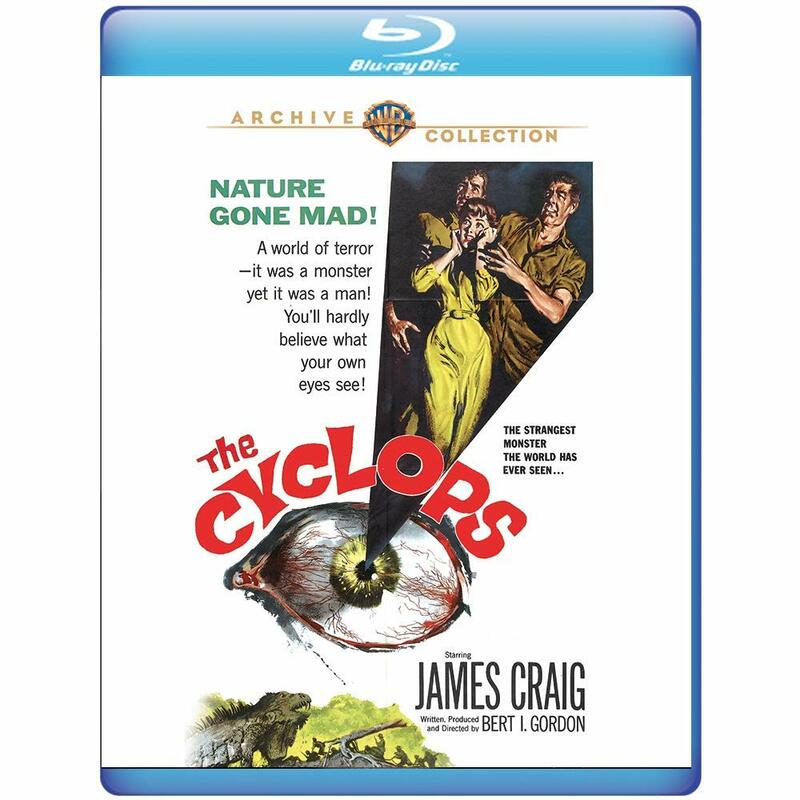 “The Cyclops” (1957, Warner Archives Collection) A search for a missing test pilot in Mexico detours in a valley (played by Bronson Caverns) where high levels of radiation have created an array of enormous animals, as well as a one-eyed, dyspeptic human giant (with vocalizations by Paul Frees). Absurd creature feature fun from Bert I. Gordon, who specialized in oversized flora and fauna (see “The Amazing Colossal Man,” “Village of the Giants“); “The Cyclops” is one of his lesser efforts due to a sillier-than-usual script and wan visual effects – the rear-projection process occasionally renders the Cyclops transparent – but the cast seems to be in on the joke (especially B-movie favorite Gloria Talbott and a scenery-consuming Lon Chaney, Jr.) and the Cyclops’ makeup, created by Jack H. Young (who worked on “The Wizard of Oz”) is E.C. Comics-style ugly. 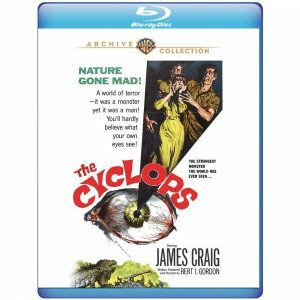 Warner Archives Blu-ray includes a previously excised face-off between the Cyclops’ eye and a flaming spear, as well as a textless theatrical trailer. This entry was posted in Movies and tagged Arrow Video, Mill Creek Entertainment, Warner Archives Collection. Bookmark the permalink.